Home » Travel » Palaces of the Hasmoneans and King Herod in Jericho (Israel, Palestine). Part One. In the beginning of 2016, while travelling in Israel and Palestinian autonomy, we visited one archaeological complex, known as Hasmonean and Herodian palaces, which is situated in the territory of the Palestinian autonomy near Jericho city. Our tour guide was Izchak Fishelevich, the very legendary and fearless guide, who had already organized our tours in Samaria, when we visited Mount Gerizim and Mount Ebal. The above mentioned archaeological complex has a vast cultural and historic significance, because it speaks of the Biblical history and history of the ancient Israel. The archaeological excavations are not over yet, but what has been already discovered by the archaeologists leaves us with a strong and sure impression of those ancient times and their rulers; and because of the diligent studies of the scientists and archaeologists, we can not only have some impressions, but see it all with our own eyes. 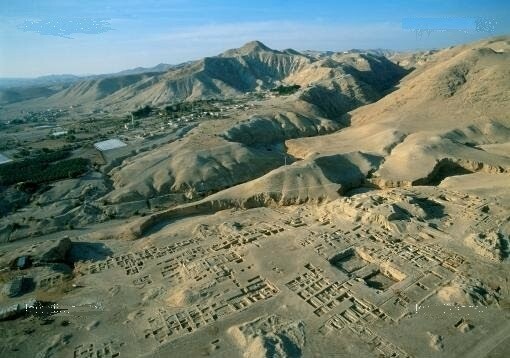 Today I will use the article, which has been posted on the web-site Biblical Archaeology in Israel, devoted to Israeli archaeologist Ehud Netzer – the one, who revealed fortress Herodion to the world; and we will get acquainted with the history of Jericho, related to the Hasmonean dynasty and King Herod. South of Jericho, not far from the ancient road going down from Jerusalem along the Wadi Qelt Gorge, there is an archaeological object that was commonly known in the past as Topol Abu al Alil. According to the scientists studying the Jericho Valley, Jericho of the Second Temple period, or Jericho of the times of Jesus Christ was situated on this site. The name Topol Abu al Alil is related to two mounds, which are located on the northern and southern sides of the Wadi Qelt Gorge. Most scientists connect these two mounds with two fortresses destroyed by Pompeus after he conquered Israel in 63 B.C. The scientists’ conclusions are based on a report of historian Strabo, who wrote that these two forts of Jericho, which protected the access to the city, were destroyed by the Roman commander. The first archaeologist, who discovered Tulul Abu al-’Alayiq, was Charles Warren in 1868. Charles Warren was a famous archaeologist and scientist, known by his works on the Temple Mount in Jerusalem. Warren’s expedition conducted excavations in nine places at the same time, where the mounds were located, with the purpose of discovering Jericho of Jesus Christ’s times. As the result, the tops of two mounds were excavated and studied. The researches of the Valley of Jericho and these two mounds were picked up by German archaeologists Ernst Sellin and Carl Watzinger. The archaeological expedition under these two scientists and archaeologists was able to study the greater part of the Jericho Valley, as well as its most ancient part, Tel Sultan mound, where at the time of Jesus Christ, Jericho was situated. In 1950, the excavations of the archaeological objects continued. American archaeologists James L. Kelso and James B. Pritchard thoroughly examined the mounds located on the northern and southern sides of the Wadi Qelt Gorge in the Jericho Valley. During the excavations of the mounds, the remains of luxurious buildings were found dating back to the period of King Herod’s reign. The most extensive study of Jericho was conducted by archaeologist from the Hebrew university in Jerusalem Ehud Netzer in 1973. During the archaeological works it was established that there really was an intensive activity at the end of the Second Temple period, but it was not exactly the city of Jericho of that time, it was a complex of Winter Palaces of King Herod, which was located near Jericho. The city of Jericho itself was not concentrated in one place, but it was scattered, and in its scattered and spread out state it looked like a city of gardens. As a result of the scientific research, Ehud Netzer came to the conclusion that the complex of winter palaces was erected in several stages at the time of the reign of the Hasmonean dynasty1. 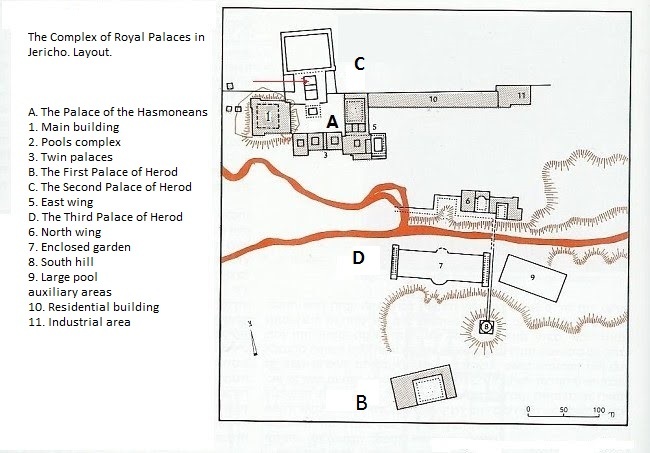 After the fall of the Hasmonean dynasty, king Herod and his sons used these palaces. 1Hasmoneans — is a priestly tribe from Modi’in settlement, which was located on the border of Judaea and Samaria where the Maccabees belonged to. The descendants of Hasmoneans ruled Judea between 152 and 37 BC. Virtually, they were the leaders of the people from the beginning of the revolt against the Seleucid Syria in 167 BC. The name Hasmoneans is mentioned by Josephus Flavius, as well as in Mishnah and in Talmud. But in the books of the Maccabees the name Hasmoneans is not found. Josephus Flavius traces the origin of the name Hasmoneans to their forefather Mattathias; the researchers believe that this name is connected to village Hashmon, region Hashmon, et cetera. The first leader of the insurgents was priest Mattathias Hasmonean, and after him – his third son, Judas Maccabeus. After Judas was killed, the youngest of the brothers – Jonathan, became the leader and then the high priest. As a result of treason and conspiracy against him, he was killed. In 140, the second son of Mattathias, Simon (Shimon), became the officially chosen ruler, high priest and chief commander of Judea. Since that time, there was the formal track of the rule of the Hasmonean dynasty. Some of the Hasmoneans were extremely cruel. For example, Simon’s grandson – King Alexander I Jannaeus, when he got tired of arguing with his opponents – supporters of the religious way of living, Pharisees, he killed 800 of them, making their wives and children watch the execution. While the slaughter was going on, he made a jolly feast – quite in the spirit of the Greek tyrants. Hasmoneans bear the responsibility for the only case in history when other people were forced to convert to Judaism. John Hyrcanus I converted the Idumeans into Judaism – they were the descendants of Esau, who dwelled in Negev and Northern Sinai. It was the Hasmoneans who brought new invaders to Judea. Romans were invited to Judea to participate in a civil war, which began between the supporters of two Hasmonean brothers, who could not divide the throne among themselves. This intrusion led to the occupation of Jerusalem, and later – to the loss of the state of Israel in the promised Land (Canaan) for two thousand years, until 1948. The end of the Hasmonean dynasty was tragic. One of the slaves, who served at the king’s palace, led a revolt, became a king himself, and founded a new dynasty, destroying all the remaining Hasmoneans. His name was Herod. He descended from those very Idumeans, who were forcefully converted to Judaism by the Hasmoneans. The beginning of the Hasmonean activities in the valley of Jericho was focused on developing the agriculture. In the modern city there is a spring Ayn Sultan – it is from this spot, where the ancient Jericho began to develop. Under the rule of the Hasmonean dynasty, the water from the spring was mainly used for agricultural purposes. The abundance of water resources in Jericho valley, Wadi Qelt, and Naaran region was used only partially. 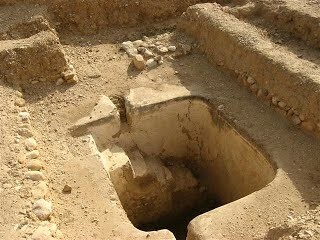 During the Hasmonean times, only three springs were used intensively that had their source in Wadi Qelt – Ayn Prat, Ayn Fawwar, and Ayn Qelt. In the northern part of the valley, the Hasmoneans built an aqueduct, which streamed the water of these three springs to the west of the valley of Jordan, where the royal manor was located, occupying the area of 45 hectares, which served as the royal gardens and farms. The excavations, carried out through the years, showed that most of the infrastructure of the royal complex was encircled by the walls, and included several agricultural objects. According to the available sources, grapes, dates, persimmon, and balm were cultivated in the gardens. Dates were the source of wages, and they were used to make wine, while persimmon and balm were used to produce perfumes and medicine. Most of the equipment, which was discovered near the gardens, was winepresses that were used to process the grapes. Other tools were designated, probably, for the production of perfume. The location of the Hasmonean Palace is unique, protruding into the valley of Jericho a little, and one can see the whole valley from here; the climate is warm in winter, the medium temperature is 10 degrees higher than in Jerusalem; close location of the gardens with greenery and fruit trees, the abundance of water – in all likelihood, these factors became fundamental for the construction of the palace here. The first Hasmonean Palace overlooking Jericho was built during the reign of the king and high priest of Judea John Hyrcanus in 134-104 B.C. When king Alexander I Jannaeus came to power, in 103-76 B.C., the palace was rebuilt. It was a two-storey building, fifty by fifty metres; there were pools, rooms decorated with frescoes, and a tower in it. Powerful earthquake in 31 B.C. destroyed the palace. Testimonies concerning this fact were discovered in different parts of the palace. According to the order of King Herod, the ruins of the palace were covered with dirt. The construction of the Hasmonean palace was carried out in six stages. 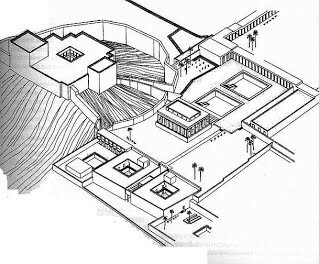 Under king Herod, the Hasmonean palace was finished and expanded. The aqueducts, which were built in the Hasmonean period, allowed to erect the magnificent complex of the Winter Palace and its gardens. The first Hasmonean palace in Jericho was built not far from the place, where Wadi Qelt Gorge leaves the mountains and cuts into the valley. The construction of the palace was preceded by the construction of a watch tower 13 by 13 meters. Many years later, the decision was made to cover the structure with earth to build a new palace above it. The tower became a part of the palace, which protected it from decay. The fist palace became the foundation of the new structure, surrounded by a moat. The earth, with which the structure was filled, helped to preserve the original building, some parts of it are preserved to the height of the second floor, which is around 7-8 meters. The walls of the first palace are built with clay blocks upon the foundation of natural stones (boulders). The walls were covered with a plaster of high quality, 1.2—1.8 meters up. In some places, traces of paint are found on the plaster. The floors of the palace were made of lime plaster on the foundation of wild stones and pebbles. This type of floors is characteristic for many rooms, halls, and courts of the different buildings in the Hasmonean and Herodian palaces. Inside the palace there was an open courtyard. Like in other buildings, the courtyard was also covered with lime plaster. Supposedly, during the reign of John Hyrcanus I, to the first pool the second pool was added, which in its shape and size repeated the first one. The combination of two pools, one next to the other, and total identity between them leads to the supposition that they were designed for two different groups of bathers, for example, for men and women. Archaeologists were able to establish that at the time of the construction of the second bath, the level of architectural design and decor was higher. This is testified by the floors near the baths, which were laid with mosaics, and the walls surrounding the pools, which were decorated with frescoes. Close to the baths, the remains of a water supply system and lead pipes have been discovered. According to the archaeologists, these could be the fountains, which were made around the baths. 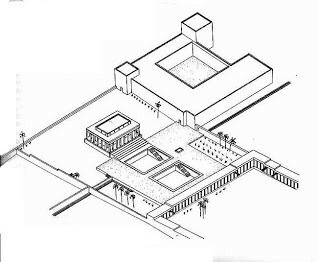 The main building of the Hasmonean palace in its size was approximately 50 by 50 meters. All the rooms of the palace were decorated with moulded details, and the walls were covered by colourful frescoes imitating marble stone. The palace, baths, and gardens were continuously supplied with water, which was delivered through the deliberately designed pipeline system that consisted of lead and ceramic pipes. By the way, close to the palace, the remains not of the two, but of two pairs of swimming pools were discovered: the smaller pools – west of the palace; and the larger pools – to the north of it. It is believed that the pools were the central place of entertainment and amusements of the palace’s dwellers. South of the large pools, a magnificent building was built; its size was 21 by 17 meters; it was a pavilion temple, built in the Doric style. The symmetrical axis runs through the pools, temples, and the yard. The periods of stay of king Alexander Jannaeus, his family, and friends at Jericho in winter and between seasons were quite lengthy. The big palace, as well as the pools and the gardens – everything here was a source of pleasure, and, maybe, even were the objects they took pride in. This place was not only fitting for staying during the winter period, but also for rest. The pastoral life of Alexander Jannaeus at Jericho was interrupted by a number of political and military crises. The king decided to create a fortified palace close to the pools. The new palace was built on top of the existing palace and was surrounded by a moat. Virtually nothing is preserved of the building, which stood on the top of the artificial hill. Part of the building, which was built of clay bricks, is destroyed by erosion. Other parts were built with stones that were later plundered. Concerning the character of the fortified palace, which stood on the top of the handmade hill, we can only guess. In the hill, square stone walls 11 by 11 meters were discovered. Another parallel wall was found that belonged to the first palace. It is supposed that the square of walls served as the base for the courtyard in the peristyle manner, which helped the air and light to get in without any openings in the walls. The walls were surrounded by a moat, which was about 7 meters deep. The maximum height of the wall was close to 10 meters. The wall around the moat was the first obstacle for the unwanted visitors of the palace. Those adversaries, who could get through the first barrier, faced the second one – a slippery ascent, which led up 15 meters to the fortified palace itself. And the last obstacle was the walls and towers that surrounded the building of the palace. The only preserved element on the slope of the hill, apart from foundations, was a system of water supply, which brought water to the upper section of the hill from the pressure pipeline (siphon). When Alexander Jannaeus died in 67 B.C., the kingdom went over to his widow, queen Salome Alexandra. She was the first and only woman from the Hasmonean dynasty, who occupied the position of a ruler. Since a woman could not be the high priest, this position under the reign of Salome Alexandra was taken by her son, Hyrcanus II. The appointment of Hyrcanus II as the high priest was accepted by all, except his younger brother Aristobulus II. The historians testify that between the brothers there was a continuous strife and jealousy. This led to the conclusion, why the twin palaces are so amazingly similar to one another. There is a version, according to which, the twin palaces were built in the period between 76 and 67 B.C. by Queen Salome Alexandra to soothe the competition between her sons Hyrcanus and Aristobulus, which lasted for almost thirty years. The size of the twin palaces was 25 by 25 meters. In the middle of each palace there was an inner courtyard, to which on all four sides the rooms exited. Each of the two palaces possessed luxurious baths. The last significant changes in the development of the palace happened after the death of queen Salome Alexandra in 67 B.C. 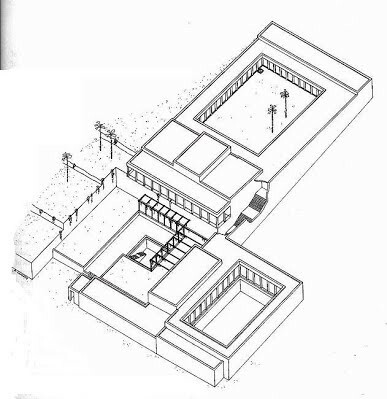 East of the twin palaces, a large pool was built, 20 by 12,5 meters long and wide, and about 3 meters deep; at the other end, the storage houses were built, 23 meters long, which were purposed to keep the products of agriculture. Many ritual baths (mikvahs) were also discovered around the palace, which belonged to the priests – they washed in them before they partook of the meat of the sacrifices. One of the discovered mikvahs served for the washing of the utensils, and pieces of 800 jars were found in it. The last king from the dynasty of Hasmoneans, whom the palace served, was king Antigonus II Mattathias. King Antigonus II Mattathias ruled from 40 to 37 B.C., which is confirmed by a trove discovered at the site of the excavations, consisting of 20 coins. This material is taken from the web-resource Biblical archaeology in Israel.